Well to be honest I was looking for a job that would open up more opportunities to grow professionally and at the same time allow for more financial freedom. My initial thoughts were that I was just putting myself into a position I never thought I would be in, a sedentary desk job. What I didn’t know is that I was entering the industry at a time where there are new and exciting trends in office ergonomics and design. 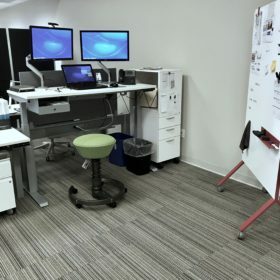 Standing desks, open floor plans, motion seating and collaboration workstations are all ways that besides looking cool, can help increase the productivity, the health and happiness of people who work, no matter the location of where they are actually working. It wasn’t long after I started that I began to hear that “sitting is the new smoking” and that doing so for prolonged periods comes with a host of negative health benefits. When possible, it’s encouraged to take breaks and walk away from your desk, but that’s easier said than done. I know firsthand the benefits of having a standing desk at my workstation. With my job change, I have now become more aware of how my overall attitude is effected by how feel during the day while at work, which is to some degree dependent on my desk and chair options. 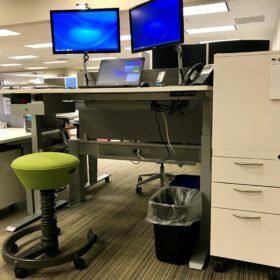 Getting to utilize my sit to stand desk has been awesome, but I realize the choice of task chair is also an important component in my overall posture and therefore my attitude. Fortunately for me I work inside a furniture showroom filled with wonderful ergo seating options so I basically have no reason to ever be in a bad mood (so says my fiancé). At the end of the day it all comes down to this. The human body was meant to move. A healthy combination of sitting and standing throughout the day is a great way to improve your posture and overall health. Finally…despite taking what many felt was a big risk with my personal career, I believe I found a job that allows me to continue to talk to people about the benefits of living a healthy lifestyle. Working with my customers I continue to encourage them to think about what changes if any they can make to create a more productive, healthier and happier work environment. I would love to meet all of you at some point, so come see me at BOLD for healthy and productive desking and seating options or come join me on the bike trails of Omaha! This entry was posted in Uncategorized on September 26, 2017 by BOLD Office Solutions.